Created by Firmenich's Natalie Lorson, the Esprit de Gingembre duo is said to evoke Schlesser's love of Asia and capture the idea of timeless freshness through ginger. Esprit de Gingembre for women has notes of bergamot, pink grapefruit, tangerine, ginger blossom, lotus blossom, white pepper, oak moss, white musk and white cedar. Esprit de Gingembre for men features ginger root, grapefruit, lemon peel, lavender, cardamom, pepper, vetiver, white musk and Atlas cedar. Also coming in September, Bond no. 9 will launch two new exclusive fragrances for Saks Fifth Avenue. Both scents were created by perfumer Michel Almairac, and the bottles are designed around the Saks Fifth Avenue logo. Saks Fifth Avenue for Her is based on gardenia, and also features notes of jasmine, vetiver and vanilla. Saks Fifth Avenue for Him features bergamot, aquatic notes, cardamom, amber and cedar. Neither of the Bond's sound particularly appealing, but the bottles are very cool. I adore gardenia, so would like to try the women's at least. And the bottle is really wonderful! I heard that Bond is coming out with body products of it's ten most popular scents in September. Have you heard anything? I have smelled the Saks For Her By Bond, and it is going to thrill gardenia lovers! It's a beautiful creamy scent. I haven't had the chance to smell the men's version yet, but the notes sound good. Yes, read the same thing: body products in the top 10 scents, and 250 ml bottles in the same 10 to follow. Color cosmetics supposedly in the works as well. Creamy gardenia sounds lovely, thanks P! Now that Bond No. 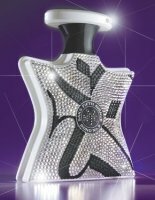 9 is doing a custom scent for Saks, will a JFK Airport fragrance for JetBlue Airways be next, complete with a bottle designed like a JetBlue tail pattern? In late 2005, Laurice Rahme listed Eau de New York, Wall Street, Chinatown, Nuits de Noho, Chelsea Flowers, Park Avenue, Chez Bond, Little Italy, So New York, and Riverside Drive. But there have been a number of releases since then, so perhaps the list has changed. Thanks for the information; but yes, I imagine it will have changed.